Available with us a wide range of Molybdenum Oxide, which is used in manufacturing molybdenum metal, alloy, catalysts and pigments. 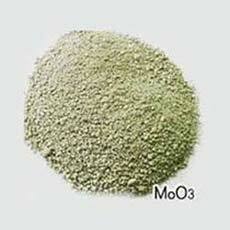 Molybdenum Oxide is also used as Halogen synergist fire retardants and smoke suppressants for wide range polymers applications. As a raw material for the production of molybdenum metal.